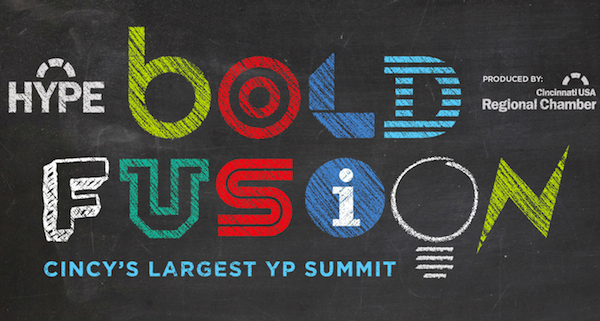 Greater Cincinnati’s largest annual gathering of young professionals, Bold Fusion, will explore the emerging concept of “intrapreneurship” Aug. 18 at Jack Cincinnati Casino. The half-day event is organized by the Cincinnati USA Regional Chamber’s HYPE program (Harnessing Young Professional Energy). In Cincinnati and elsewhere, intrapreneurs are working in Fortune 500 companies, small private companies, the arts and nonprofit organizations. Bold Fusion’s local speakers — Tony Blankemeyer, Valerie Jacobs, James Marable and Ross Meyer — will share their experiences as intrapreneurs within a variety of Cincinnati organizations. Companies might find that embracing “disruptors” in their ranks can be challenging, they say, but the results speak for themselves when employers help creative employees develop their own intrapreneurial skills. “Over the past few years, the market has been exposed to startups more than ever before, making their founders into a new breed of celebrities,” says Jacobs, Chief Insight & Innovation Officer at LPK. “Yet many people work for larger organizations and are unsure how these startup stories apply to them. During my talk, I hope to inspire people who have an entrepreneurial spirit — but maybe not the risk profile to create their own company — to nurture the startup mentality within themselves and their organizations. The companies the speakers represent are doing their part to cultivate young professional employees and encourage engagement across the wider region. “We’re active participants in many industry organizations, and our engagement with the area’s startup ecosystem are just a few ways we connect with our community,” says Blankemeyer, Startup Liaison & Data Commercialization Lead at 84.51°. “One of the things that I enjoy being involved with is our ‘Degrees of Giving’ initiative, where our staff gifts their time, talent and fundraising efforts to employee-selected Greater Cincinnati nonprofits. For many young professionals, Greater Cincinnati offers unique opportunities and accessibility for those looking to impact their community. Bold Fusion also showcases intrapreneurs who are stepping up to help nonprofits engage millennials and young professionals in supporting the region’s cultural assets and offering solutions to social problems. Bold Fusion begins with registration and networking, followed by the four local speakers presenting in a TED Talk format. Husband-and-wife duo Allen and Kyla Woods will serve as moderators, while Brandon Black, a graphic note taker, will live-illustrate the presentations. Anand will present the keynote talk before the event wraps up with a networking happy hour. People of all ages, not just YPs, are encouraged to attend. That said, space is limited and HYPE expects another sold-out event, so early registration is encouraged. “There will be clear takeaways from all of the talks,” Fiola says. “People will be entertained and inspired and have ideas they can take back to use in their workplaces. Get more information about Bold Fusion and register to attend here.